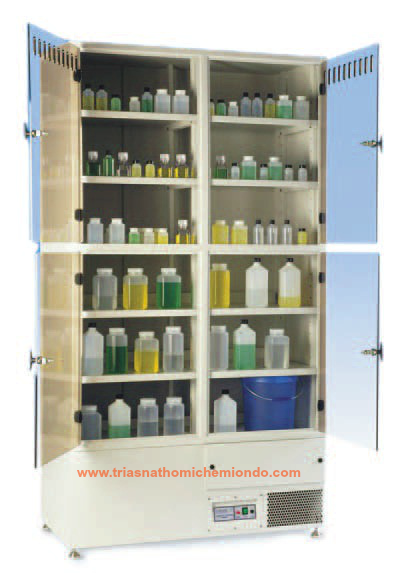 Our range of Chemical Storage Cabinets have been specifically designed for the long and short-term storage of Histological specimens stored in hazardous solutions i.e. Formalin. Ensuring complete COSHH compliance and providing fume containment. The CSC’s are available in two standard widths. Any combination of which can be joined together to provide a continuous run of cabinets. Non-standard sizes are available on request. 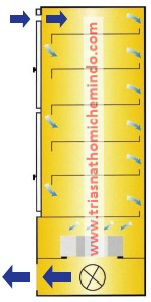 Optionally a high level exhaust with top mounted filter and fan box is available instead of the low level standard system. Also ducted variants are available POA. Fume containment is achieved with a constand airflow in to cabinet which circulates around all shelves. This air is then pulled through a long –life chemically impregnated Actived Carbon Filter and exhausted back into the room. 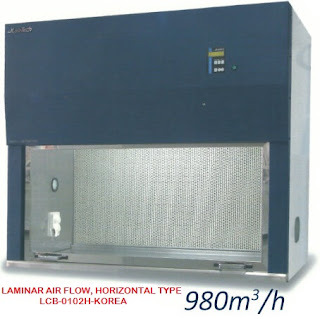 The use of an Activated Carbon Filtration ensures that there is no costly installation and no need to connect to external ventilation, making the inclusion of a Labcaire Storage Cabinet the obvious addition to a new or existing Laboratory or Operating Theatre. Easy acces to the Carbon Filter ensures maintenance of the cabinets is both a simple and time efficient procedure, whilst being constructed from epoxy coated mild steel means the cabinets are sturdy and corrosion proof.